PaperPort 14 is the fastest and easiest way to scan, share, search and organise documents, files and photos. The visual document desktop along with one button scanning creates large clear thumbnails of all your documents that you can move and stack like paper, making Microsoft® Windows® more productive. It’s no wonder millions of people worldwide rely on PaperPort to eliminate paper, get more organised and achieve new levels of personal efficiency. 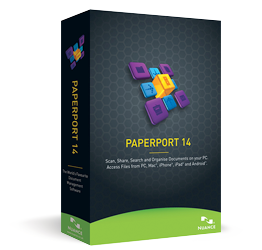 PaperPort 14 is our popular scanning and document management software application designed for home office use. An easy to use combination of traditional file cabinet and digital document desktop, PaperPort 14 enables you to scan organise, find and share all of your documents and photos from your PC. It enhances the capabilities of your scanner or all-in-one device to quickly transform paper - mail, photos, legal paperwork, tax information, forms, bills, receipts warranties and other important documents - into high quality, searchable PDF files with the click of a button. It even puts all the PDF files on your desktop in clearly marked, colour coded folders, so information is always at your fingertips. PaperPort provides a single way to scan paper and access, view, edit and convert files on your PC. PaperPort reduces the complexity of scanning to a single push of a button. Setup is a breeze and once you get started, you will quickly have all your documents stored and accessible in one easy to use application. Reduce waste and conserve energy by putting an end to your reliance on printing, faxing and mailing. You’ll save money, too. Once a document is filed electronically in PaperPort 14, it will never be lost, damaged or accidentally thrown away. PaperPort 14 includes a powerful PDF Viewer that can replace the free Adobe®Reader®, so you can view, edit and share PDF documents like never before. Make your digital photos look better than ever with a feature rich set of photo tools and optimal resolution for screen and print. Just drag and drop onto any text application on the PaperPort Send To bar to turn scanned document images into editable text for use in popular word processing or spreadsheet software. FormTyper® converts scanned paper forms into electronic forms you can fill out, save as PDF and email. It’s fast, easy and automatic. Make your all-in-one printer, mobile scanner or desktop scanner faster and easier to use with PaperPort 14. Get better results, too. The Nuance Cloud Connector application: Now you can gain access to a number of cloud services, including Windows Live SkyDrive, Google Docs, Box.net and many more. Plus, files are accessed in the PaperPort folder directory, so you can scan, stack or unstack PDF files which are automatically uploaded in the cloud. Evernote “Send To” Connector: Drag and drop files to the Evernote Send To Connector, create a new note or add the document to an existing note. You can also right click on the Evernote connector and get files attached to any note so they are copied to the PaperPort desktop. Scanning improvements: We’ve enhanced PaperPort’s scanning capabilities to include scan and open a document with one press of a button, create and save default custom file names and create PDF/A directly from your scanner. New Scanner Enhancement Tools (SET): The Scanner Enhancement Tools help you create perfect scans right from the start or fix any scanning imperfections manually. New tools to clean edges of scanned documents include punch-hole removal, auto-cropping and border cleaning. The new despeckle feature helps you clean black and white - especially halftone - images from black dots for better image quality and OCR results. Support for favourite web page bookmarks : Now you can select from any of your stored favourite web page links using PaperPort 14 and open within your browser application. PaperPort 14 presents you with the list of the saved web page bookmarks of your Internet Explorer, Firefox or Chrome browsers so you start browsing from PaperPort. Note: Performance and speed will be enhanced if your computer’s processor, memory and available disk space exceed minimum requirements. This is especially true when converting very large colour PDF files. Technical Support: Nuance offers technical support via phone and email. Visit www.nuance.co.uk/support for our current support policy.